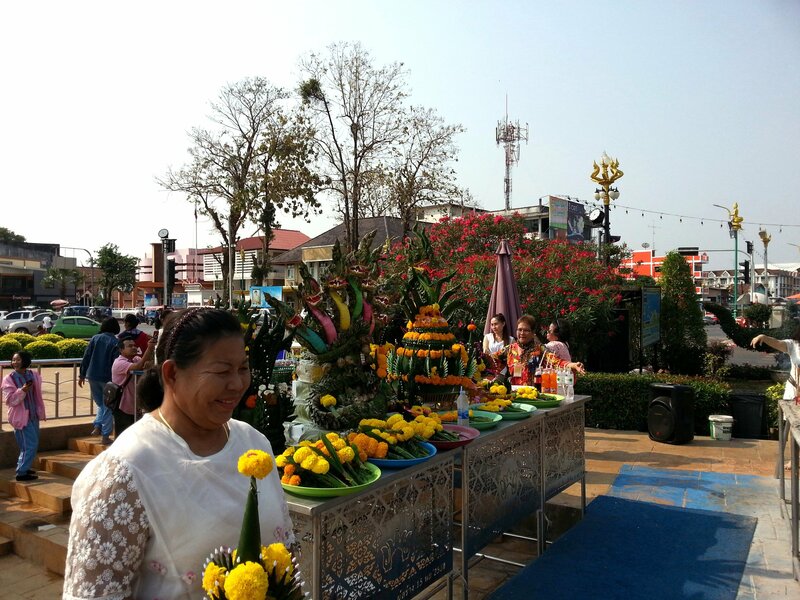 The Naga Monument, also known as Phaya Si Sattanakharat, is located on the riverfront in the centre of Nakhon Phanom town near the Immigration Office. The Naga Monument is free to visit at all time of the day all year round around although the exhibition room under monument is only open during daylight hours. 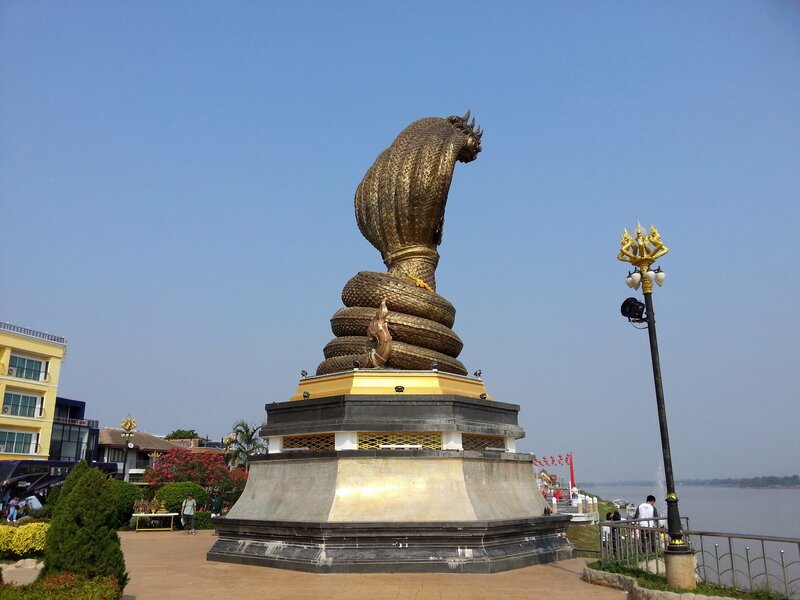 The Naga Monument is a new addition to the riverfront area of Nakhon Phanom having been installed in 2016 as part of a drive to increase tourism in the North Eastern Region of Thailand. The statue is 15 metres high, 5 metres of which is its octagonal base. The statue itself is cast from brass and weighs around 9 tonnes. The Naga Monument attracts a steady stream of Thai visitors who come in the day time to make offerings and pray, and at night to see the Monument illuminated and spray water from the top of the statue. Some Thai visitors believe that the Naga Monument is lucky and that by praying there and making offerings they will get some of that luck. As at other similar monuments in Thailand, you will find lottery ticket sellers doing a brisk trade near to the Naga Monument. The significance of the Naga Monument is the local belief is that Naga live in the nearby Mekong River. A Naga is a mythical creature, part-serpent and part-human, from Hindu mythology which has been adopted across South Asia as part of Buddhist theology. The Naga King is believed to have protected the Lord Buddha during the marathon meditation session during which he achieved enlightenment. The Naga are believed to live in a divine netherworld crossing to and from the human world, according to some Thai Buddhists, through Kham Chanot Forest, which is located in Wat Kham Chanot in nearby Udon Thani Province. According to legend the Naga that dwell at the bottom of the Mekong River are responsible for the famous ‘naga fireballs’ which are glowing lights purportedly since rising from the Mekong River in late October each year. 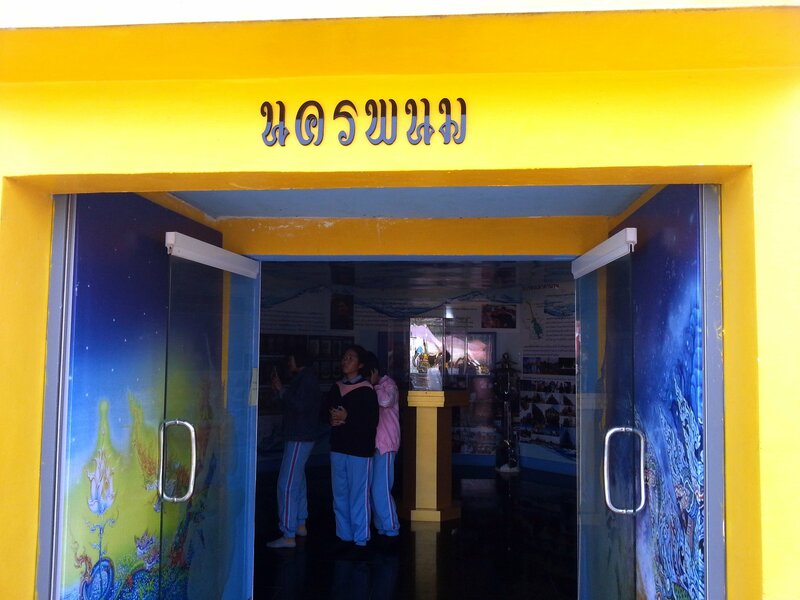 The Naga Monument is located 2.1 km by road from Nakhon Phanom Bus Station.